Amaravathy resorts is located in a unique spot, where both the sea and backwaters vie for your attention.Resorts is an exquisite combination of traditional and modern villas. It is a place you experience the love of nature and a rare blend of beauty, the beach and back water for you. Stroll the beach with mesmerising fantasies! 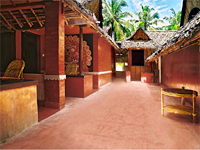 Reminding the skill of creator, the surroundings are gifted with back water and surrounded by coconut palm grooves. Let you restore your energies and rediscover yourself. The resort provides great accommodation options for budget conscious travellers who are looking for a place of stay by the beach side. 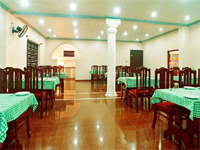 Apart from the comfortable theme-based rooms, the Amaravathy resort also offers heritage cottages to the guests. The rooms are amply furnished and feature all the basic amenities that are required by people on the move.